In early 2012, I spent a couple of weeks with the fine folks at the American Farm Bureau Federation, which is a major provider of news and commentary to the farm press and farm community. 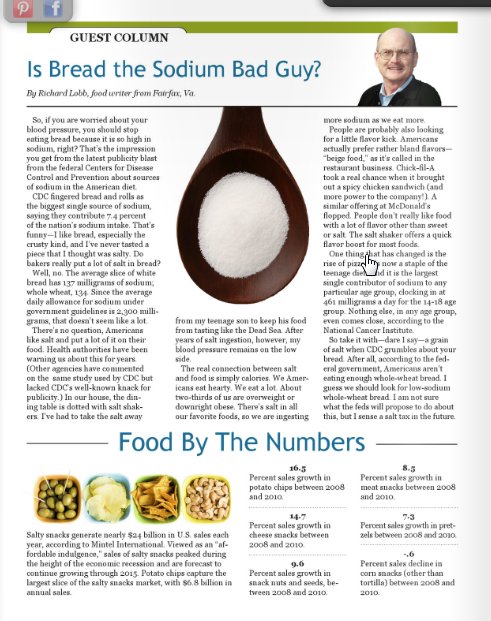 I wrote a couple of pieces that were widely distributed: a column on sodium in bread and one on farm safety. The text of each column is shown below as well as a screen grab of the sodium piece. Is Bread the Sodium Bad Guy? Well, no. The average slice of white bread has 137 milligrams of sodium; whole wheat, 134. Since the average daily allow for sodium under government guidelines is 2,300 milligrams, that doesn’t seem like a lot. There’s no question Americans like salt and put a lot of it on their food. Health authorities have been warning us about this for years. (Other agencies have commented on the exact same study used by CDC but lacked CDC’s well-known knack for publicity.) In our house, the dining table is dotted with salt shakers. I’ve had to take the salt away from my teenage son to keep his food from tasting like the Dead Sea. After years of salt ingestion, however, my blood pressure remains on the low side. The real connection between salt and food is simply calories. We Americans eat hearty. We eat a lot. About two-thirds of us are overweight or downright obese. There’s salt in all our favorite foods, so we are ingesting more sodium as we eat more. People are probably also looking for a little flavor kick. Americans actually favor rather bland flavors — “beige food,” they call it in the restaurant business. Chick-fil-A took a real chance when it brought out a spicy chicken sandwich (and more power to them!). A similar offering at McDonald’s flopped. People don’t really like food with a lot of flavor other than sweet or salt. The salt shaker offers a quick flavor boost for most foods. One thing that has changed is the rise of pizza. It’s a staple of the teenage diet now. And it is the largest single contributor of sodium to any particular age group, clocking in at 461 milligrams a day to the 14-18 age group. Nothing else, in any age group, even comes close. So take it with — dare I say — a grain of salt when CDC grumbles about your bread. After all, according to the federal government, Americans aren’t eating enough whole-wheat bread. I am not sure what the feds will propose to do about this, but I sense a salt tax in the future. March 4-10, 2012, is Agricultural Safety Awareness Week, when Farm Bureau reminds farmers and ranchers to take time to be safe as they go about their daily tasks. A little awareness goes a long way, and safety is always a good investment. Any occupation that involves physical labor and the use of moving equipment has a built-in level of danger. So the farm or ranch has its share of hazards, just like any workplace. According to the U.S. Labor Department’s Bureau of Labor Statistics report for injuries on the job in the year 2010, the workforce involved in growing crops or raising animals experienced proportionately fewer injuries than those working in sawmills or in iron foundries, but slightly more than people working in underground coal mines. Working in farming is more hazardous by that measure than working in construction but about the same as a machine shop. Statistics are also kept on accidents that involve fatalities. According to BLS, in 2010 some 312 people died while working in crop production and another 151 in animal production. Adding in people working in support activities (like soil preparation), 495 agricultural workers lost their lives on the job in 2010. The stats cover only farms with 11 workers or more, so small family farms are not counted. Still, the tally is spread over about 900,000 workers, which represents a sizable portion of the agricultural workforce. The annual cost of agricultural occupational injuries and fatalities has been estimated at upwards of $4 billion, and the real cost could be far more. There is the direct medical cost, the loss of productivity and the disruption that occurs when a farm operator is put out of commission for any length of time. And it’s impossible to put a real value on a life that is actually lost. The emotional toll on family members and other workers is an additional factor not to be overlooked. Thankfully, progress is being made. Technological improvements alone are bringing a higher level of safety to farm work. For example, tractor rollovers have been a major cause of injury or death, occurring mainly when equipment is operated on sloping ground or too close to a ditch. But rollover protection systems (ROPS) are now standard on new tractors. The investment in adding rollover protection and seatbelts to older tractors will pay great dividends if these tractors are involved in a rollover. Safety on the farm is like anything else; it improves when you work at it. If the farm operator sets and enforces certain rules, the margin of safety will increase. Take tractor safety, for example. Proper maintenance of equipment and enforcement of rules such as “No seat, no rider” are smart investments of time and money. Awareness works. For example, Farm Bureau has put the spotlight on children and teenagers and the work they do on farms. The organization has emphasized that while farm kids are frequently vital to the success of a farm, many, but not all farm jobs are appropriate. Partly as a result of greater awareness, injury rates among youth on the farm were cut in half from 1998 to 2009, according to the Centers for Disease Control and Prevention, citing data from the National Institute for Occupational Safety and Health. While it’s hard to quantify the total impact of accidental injury or death, it’s easy to see that any farm is better off without them. Awareness of hazards and a commitment to safety for everyone on the farm is an investment that will pay off many times over. Richard L. Lobb is a guest contributor to the Focus on Agriculture column series this week. He is a long-time agricultural communicator.